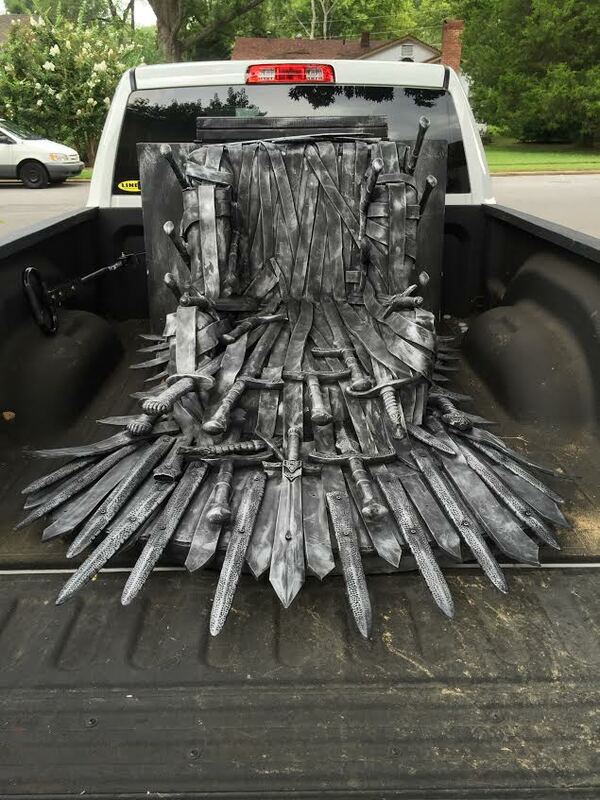 Imagine my surprise when a friend of mine, Josh, showed up at my annual “Welcome to Dragon Con” dinner and announced that he had built an Iron Throne and carted it to Atlanta from his home in Alabama. 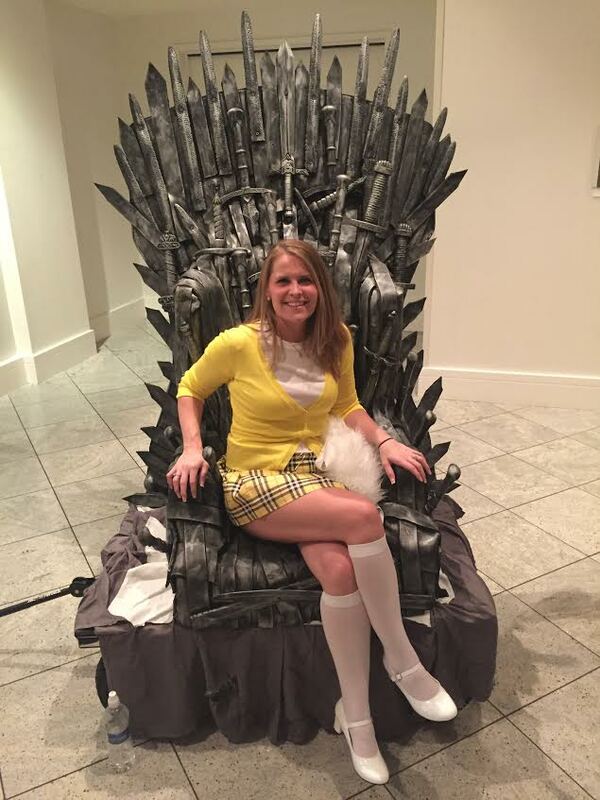 I was more than a little bit excited to hear about this, and I definitely flagged him down a few times throughout the weekend to take pictures on/around the throne…but I also heard about it practically everywhere I went. “Have you seen that guy with the Iron Throne?” “Have you gotten to take a picture with the Iron Throne on wheels?” Not only was I asked about it several times, but I overheard countless conversations about it. 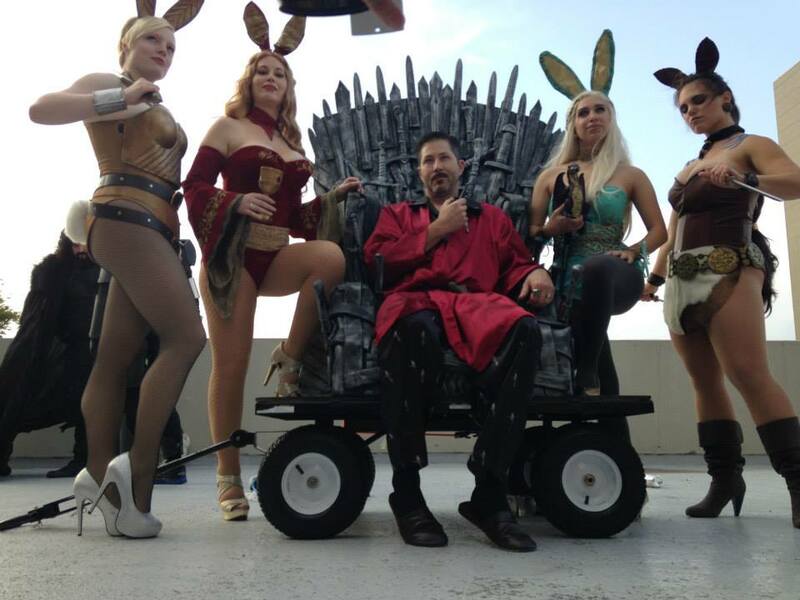 Everyone was so excited that there was an Iron Throne at Dragon Con, and after returning home and seeing how many times it popped up in Dragon Con albums all over the internet, I decided that Josh deserved a bit of the spotlight himself – not only for creating such an awesome “prop”, but for carting it around all weekend. I shot him some interview questions, asked for a few of his favorite pictures, and now I introduce you to “The Guy with the Iron Throne”! Tara: What made you decide to take on a project like this? Josh: I decided to take on the Iron Throne for several reasons. I am a huge Song of Ice and Fire book fan and Game of Thrones show fan, and The Iron Throne is such a central feature to both. I thought it was a natural fit to create something in one of my favorite fandoms. 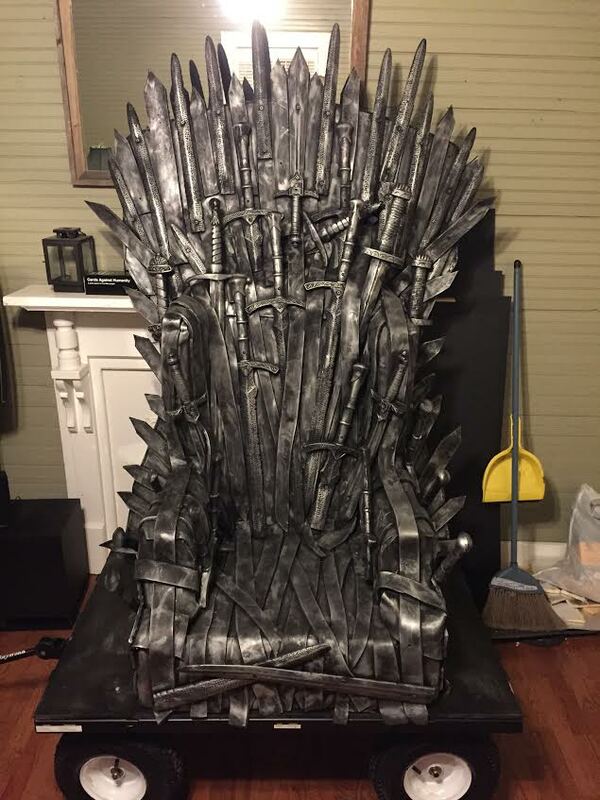 I had also become interested in expanding my cosplay hobby into prop-making and had only seen one custom-made representation of the Iron Throne outside of the official Game of Thrones Exhibition – and had certainly never seen a mobile one designed for conventions, probably because the “real” one is too big to fit into most venues without special assistance. But, based on seeing the fan-made one and discussing it with my cosplay and prop-making friends, I knew it could be done. Also due to some circumstances such as some of my planned cosplays running into snags and my normal seamstress being busy on another costume commission, I wasn’t going to be able to debut any new costume at Dragon Con like I normally would. So in lieu of a new costume I decided to take on a new prop. I also knew that if this project was successful, it would attract a lot of attention, allow me to meet a lot of interesting people at conventions, and could be used in the future for many things like local events, other conventions, photo shoots, etc. 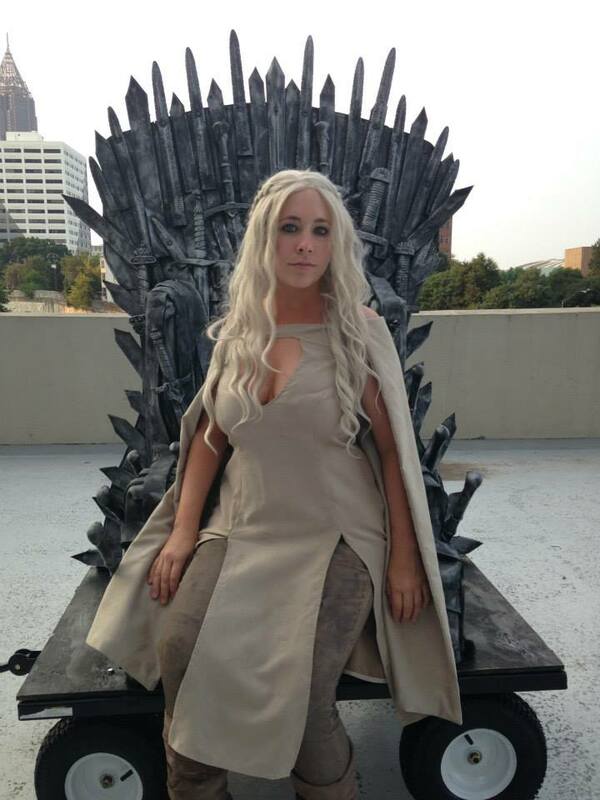 Plus it just seemed like a fun thing to do – not many people can say “I built an Iron Throne”. T: Can you tell us a little bit about how you built your Iron Throne? 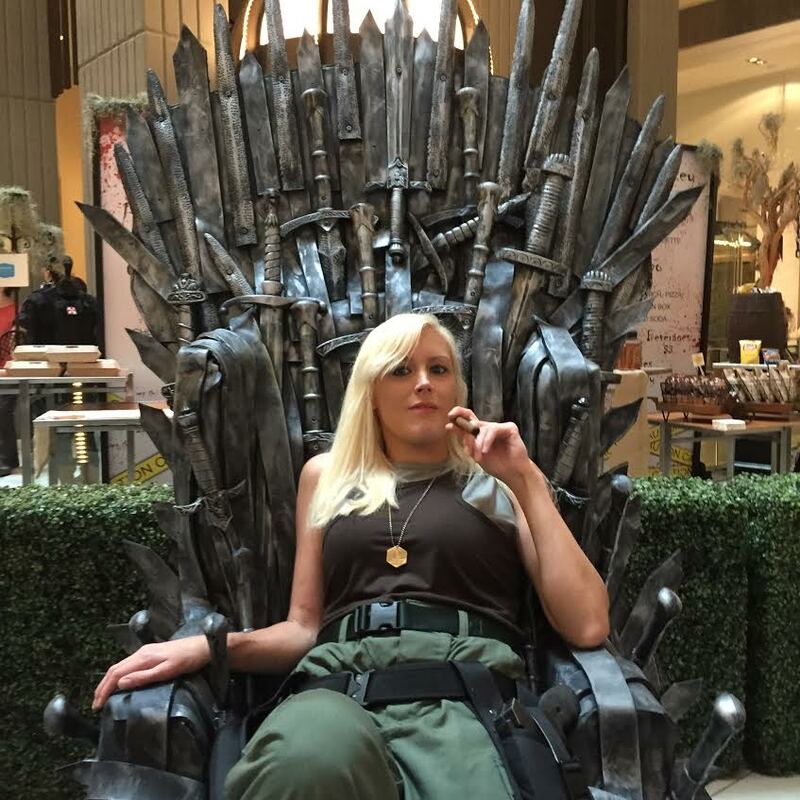 J: The Iron Throne started with a high load capacity garden cart from Tractor Supply Company and a green wing back chair from the local thrift store. From there, my co-builder James Curley and I added a wooden platform to the cart for extra support and modified the chair in various ways to make it more practical to work with and more “throne-like” (for example, we removed the existing legs, added extra wood under the bottom and back of the chair for support and to have something sturdy to attach the remaining materials to, etc.). Then we added wood to the seat and the seat back to make the chair flat instead of cushioned and to make it easier to attach the foam. 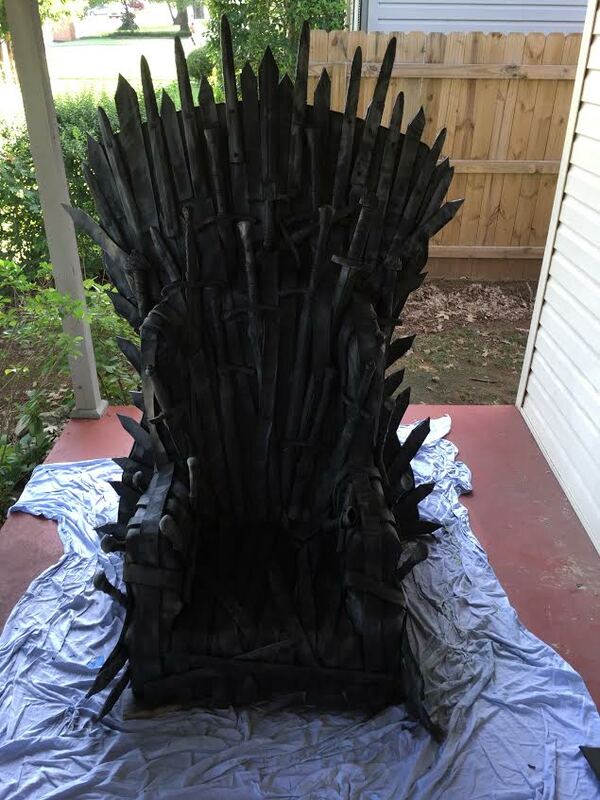 Next we cut and shaped a wooden back that mimicked the shape of the Iron Throne and attached it to the chair back. Then we covered virtually the entire thing in housing foam (the rigid kind of foam used as housing insulation and under vinyl siding) in order to have an easy base to attach the EVA foam as well as to make the entire thing safer. T: I have to ask – why bring it to Dragon Con, of all conventions? Were you nervous about doing so, since Dragon Con is so huge? J: That’s a great question. 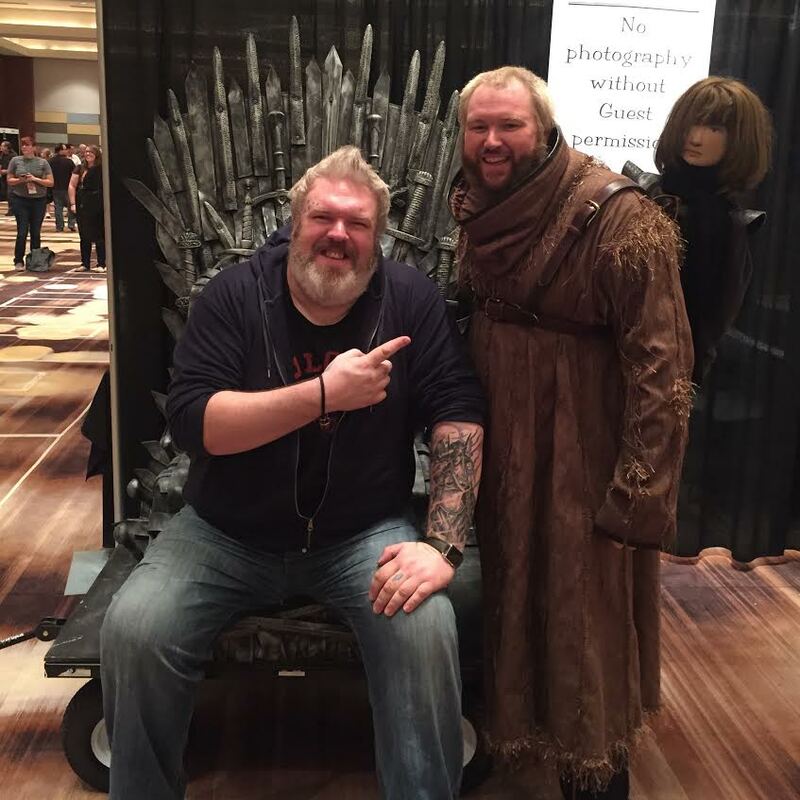 I wanted to do it for Dragon Con primarily because for the first time there were guests from Game of Thrones (Kristian Nairn/Hodor; Finn Jones/Loras Tyrell; and Julian Glover/Grand Maester Pycelle) that were going to be in attendance, one of whom (Kristian Nairn/Hodor) portrays a character that I cosplay. So I thought it would be a great opportunity to interact with those guests and others in a fun and unique way. Also, I wanted to do it at Dragon Con because there is a larger Game of Thrones presence there than most other conventions I attend, and because I thought that there would be more interest in it at Dragon Con than many other conventions I could have debuted it at, because Dragon Con has a track specifically dedicated to fantasy. Another reason is that Dragon Con is widely known as one of the best places to showcase your best cosplays and props and as I stated earlier, I had seen only one other recreation of the Iron Throne at any other convention or venue outside of the official Game of Thrones Exhibition, so I knew that if I did it right it would be a huge hit. I was actually very nervous about bringing it to Dragon Con, especially because of the large crowds, but I would have been nervous to take it anywhere at first too. I didn’t get a chance to even test drive it before I arrived at Dragon Con because I finished it at 4am Wednesday morning, so later that Wednesday night before the convention actually started was literally the first time I’d ever taken it off the truck and attempted entry into a commercial building. The funny part is that I didn’t have any difficulty getting into the hotel, but the throne wouldn’t fit in my hotel room by about an inch and a half on the width, so I wound up having to store it on the truck in valet parking. But it actually worked out that way because I had guaranteed help loading and unloading it and I was already at street level. I was also very nervous about it breaking or someone breaking it, but it survived the convention very well for a prop that was designed to be sat upon. 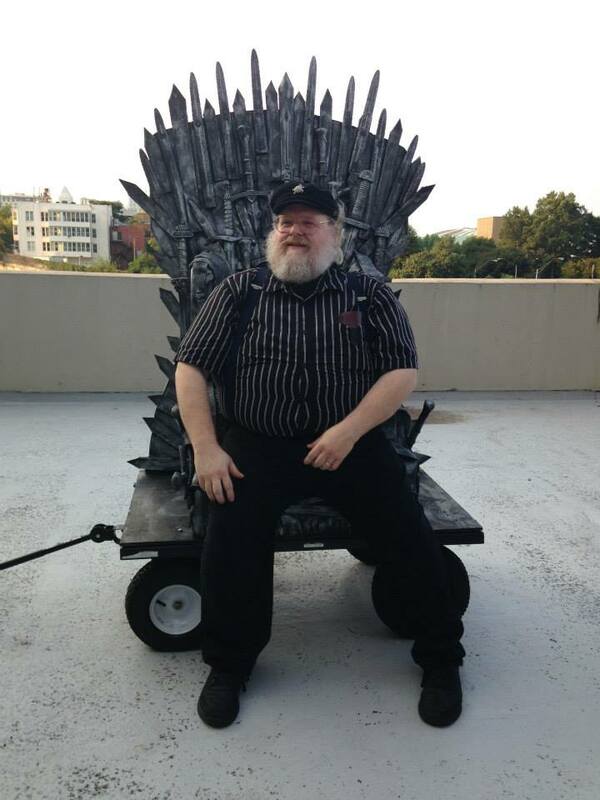 T: In line with that question, what was the most difficult part (or parts) of being “The Guy with the Iron Throne”? 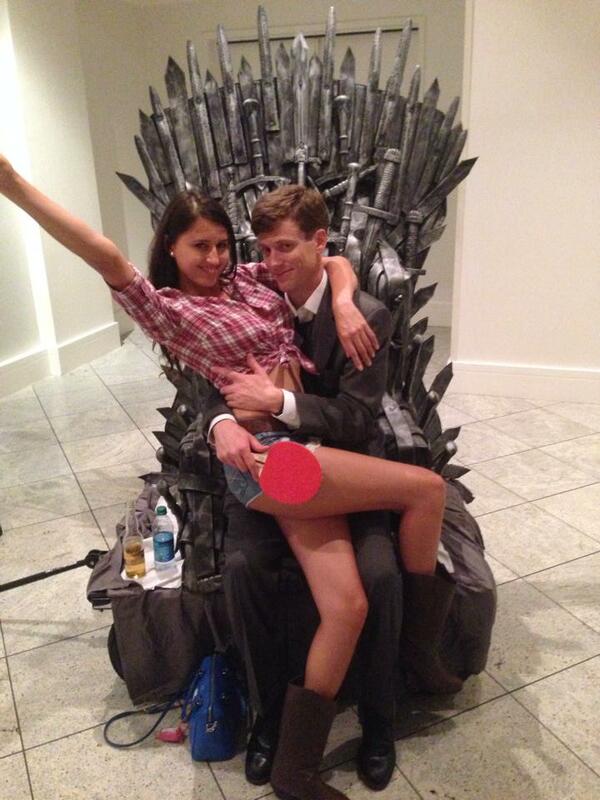 J: There were definitely a few difficult parts to being “The Guy with the Iron Throne”. The first was the challenge of physically maneuvering it around Dragon Con due to distances between hotels, street inclines, and crowds – not to mention that it is somewhat heavy to begin with. I usually mitigated the difficulty with crowds by not even attempting to bring the throne out at certain times and by taking street routes where possible. The other issue was both a blessing and a difficulty – the throne was so popular that I literally could not stop moving or I wouldn’t be able to move again for a long time due to the sheer number of picture requests and people who wanted their picture sitting on the throne. It was even more difficult in those times when I had to refuse to stop or refuse to allow pictures. I wanted everyone who wanted it to be able to get a picture but there were times that if I didn’t refuse, I would have been stuck in a location or made late to other Dragon Con events I had committed to going to. The third difficulty is similar in nature in that I wound up giving up much more of my time than I anticipated to allowing pictures with or on the throne and did not do some of the things I wanted to do at the convention as a result. It was both rewarding and disappointing as I got to meet some really great people and get some really great pictures but I also missed some events and meet-ups that I would have otherwise attended. Frankly, I couldn’t not have predicted the popularity of the throne and I suppose I made the choice to continue allowing pictures, but it was difficult for me because I didn’t want to disappoint all the people who were so clearly excited about this prop I had made. And the final and perhaps most difficult thing was keeping the prop intact and undamaged through the convention. For the most part, everyone was very nice and very considerate, but there were a few too many people who had to be reminded that it is basic convention etiquette not to touch or sit on someone’s prop without permission. The worst cases were where individuals (who had typically been drinking too much) thought it was okay to grab and pull on the throne or seat themselves on the throne without permission. In one of the few instances where someone was able to get on it while I was distracted, that person broke 2 of the sword hilts off the throne trying to get out of it in. One thing I learned from this process was that a large prop like this requires constant vigilance as well as assistance from others for the safety and security of both the prop and the people interacting with the prop. T: Last but not least (yet probably most important! ), could you share a few of your favorite memories from the weekend? J: Some of my favorite moments from the weekend were getting 2 different George R.R. Martins, numerous other Game of Thrones cosplayers, and many other random cosplayers on the Iron Throne, the strange and funny requests for pictures with the Iron Throne (like a stuffed Pikachu, a Hobbes from Calvin & Hobbes, and a Muppet-style puppet to name a few), being interviewed by various websites and by the local CBS news station, getting to bring the Iron Throne to the Game of Thrones photo shoot and sitting in it as Hodor for the big group shot, as well as getting a shot of me and the other Hodor cosplayer doing a tug of war over the throne, the unexpected requests from parents to let their babies and kids sit and get their picture on the Iron Throne, and getting Kristian Nairn (Hodor) and Finn Jones (Ser Loras Tyrell) to come out and get their picture on the Iron Throne. 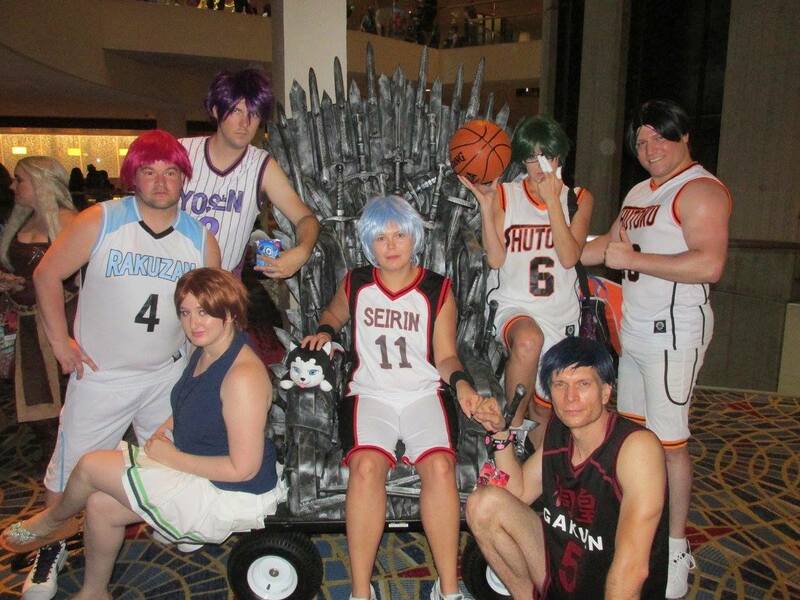 I also had a few favorite memories that didn’t involve the Iron Throne so much, such as getting to spend Dragon Con with my girlfriend and my amazing friends, attending the Mechanical Masquerade, and meeting John Barrowman from Arrow/Dr. Who and Ksenia Solo from Lost Girl. T: Any other comments or thoughts? J: I was astounded by the popularity of and interest in the Iron Throne. I talked about it so much to so many different people that I lost my voice, and after the convention I noticed how many people had changed their Facebook profile picture to be them on the Iron Throne. I was humbled and grateful to be a part of so many people’s Dragon Con experience. I was also so touched and grateful that several of my friends and even some strangers took the time afterwards to say thank you as that made the difficulties worth it. T: Additionally, if you’d like people to be able to find you on social media, where can they do so? J: My Instagram handle is doppelraver_cosplay and my Facebook cosplay page is Doppelraver_Cosplay & The Adventures of Bran the Boi. I’m also an Officer of the North Alabama Cosplayer’s Club. Check them out on Facebook, too! 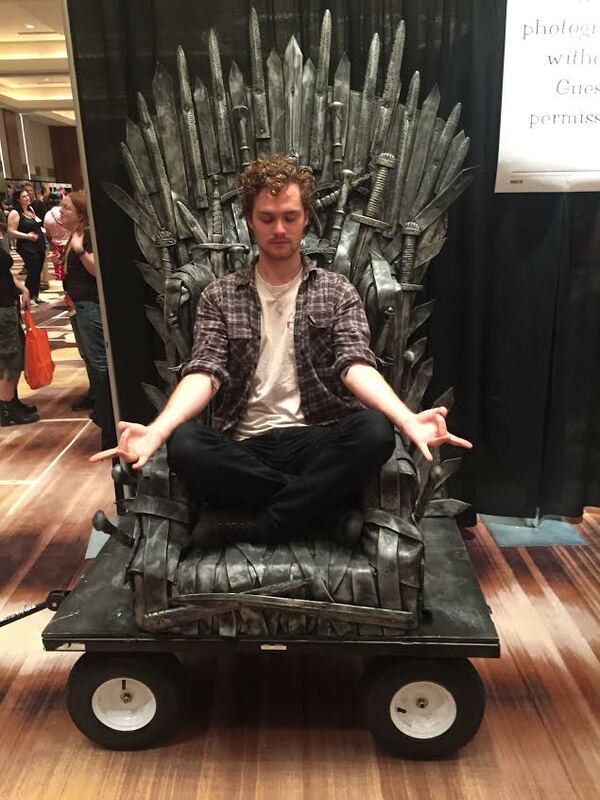 We’d love to see more pictures of Josh and/or his Iron Throne, so please to leave yours in the comments!